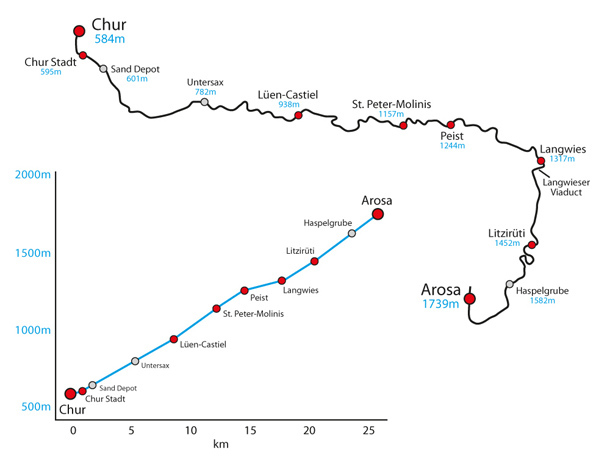 The 25 km long Arosa Line winds its way from Chur, the oldest town in Switzerland, up to the Summer and Winter tourist resort of Arosa. The line was opened in December 1914 to both passengers and freight. Surprisingly, the distance between the two towns is less than 14 km and the route gains its length from a multitude of hairpin turns which help it climb over the 1,100 m that separates the two communities. The Arosa Line also features a large number of tunnels and viaducts, including the Langwieser Viaduct, a pioneering reinforced concrete structure that spans the Plessur River with the single track. The site today is of national significance, and in the winter months, Christmas lights are hung from the viaduct so it can be seen for miles after dusk. Given all the twists, turns and structures, it takes about an hour to traverse this breath-taking line. While a standard route nonetheless, the approach to and from Chur is most unique. Over 2 km of the track outside Chur's main station runs through the streets of the town itself, this is known as the Chur stadtbahn (town railway), and requires extra vigilance as you share track with road traffic and pedestrians. This entire stretch has been carefully modelled and detailed to provide a unique driving experience in Train Simulator. With Arosa being a tourist resort all year round, the line sees a lot of passenger traffic, but a significant amount of freight is also transported between the two towns. Mixed trains are a common occurrence on the RhB railway network, so having to haul a little extra load is to be expected. Uniquely, it is not just locomotives that do the hauling, the local electric multiple units will also carry extra passenger coaches, as well as freight, along this incredible railway. The latest EMU to be put to work along the Arosa Line is the RhB ABe 8/12 Allegra, this 3-car unit was introduced in 2009 and is designed to handle the steepest grades of the RhB railway network, such as those found between Chur and Arosa. The Allegra offers unmatched views for first class passengers, where windows can provide a driver's eye view of the mountains, and is easily accessible with a low floored centre coach. Not only does the Allegra perform as expected, it exceeded all measures in December 2009 when a not-in-service unit set a new metre gauge speed record, clocking in at 139 km/h. A total of 15 Allegra ABe 8/12s operate in Switzerland, and all of them are named after famed Swiss men, including Friedrich Hennings, chairman of construction for the Albula Line, and Willem Jan Holsboer, a founder of the Rhaetian Railway (RhB). Metre gauge track system with 3D sleepers, animated junction levers and illuminated indicators covering the 25 km line. All new request stop features designed especially for the Arosa Line. Over 100 overhead line equipment and catenary models. Dynamically operating pantographs for the Abe 8/12 Allegra. Player locomotives have pantographs that dynamically follow the height of the overhead wires and lower through tunnels. Over 50 custom bridge and tunnel portal models designed to accurately represent the stunning engineering of the route. Highly detailed station models designed from our survey of the route in early 2017 along with many other feature models along the line. Animated ski lift models in Arosa. Detailed rock face models to capture the breath-taking scenery of the route. All new ABe 8/12 Allegra Electric Multiple Unit in branded RhB livery with correct body side nameplates for all fifteen set numbers (3501 – 3515). Dynamic and selectable pantographs with sparking feature. Animated wing mirrors and exterior driver character that automatically moves to the driving end of the train. Player selectable destination system. Automatic speed control system and a host of other in cabin features. Passenger view for the EWA coach of the Allegra where you can take in the breath-taking scenery and observe the driver's cabin through the glass partition. Lb-v container wagons, Sp-w timber wagons and all-new Fac hopper wagons are included. Route fully configured for Quick Drive scenarios and Allegra trainset compatible with our existing Albula route Quick Drive (Albula Line available separately). 3 x Railfan mode scenarios. 7 x Career scenarios including a guided tutorial for the ABe 8/12 Allegra train.